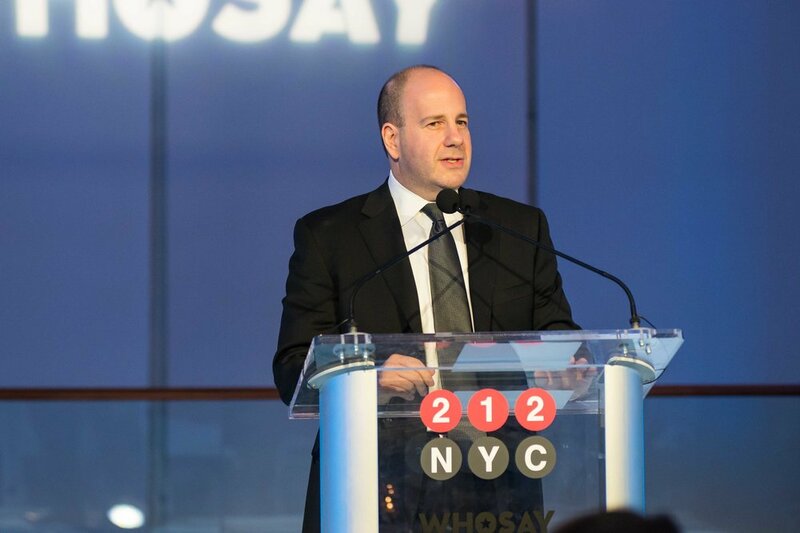 At WHOSAY, we’ve always believed in the power of humans, and their creativity, to solve problems and deliver measurable results and the host and honorees of the 212NYC Winter Gala 2018 reinforce that vision. Honorees Salima Popatia, VP Global Online Marketing & Merchandising at Estee Lauder, David Cohen, President North America, Magna Global and host Shenan Reed, President, Chief Client Officer, Publicis Groupe, shared the wisdom that has positioned them as advertising’s households names while preserving the vision that keeps them ahead of the curve. Also, as honorees were the recipients of the 212NYC Weaver Award for Digital Sales Excellence, Katherine Divney, Seeking Alpha, and Meiling Morris, Scripps Networks, as well as the recipients of the 212NYC Ari J. Bluman Rising Star Awards, Alyssa Sergi, Wavemaker and Anishaa Janardan, Spark Foundry. The 15th edition of the 212NYC Winter Gala, “Crystal” edition as host Reed pointed out, kicked off with an inventory of the changes undergone by the industry since the Gala’s foundation in 2003. “In 2003 women were 20% of the agency leadership today we are 32%,” Reed said, delivering one of the most positive points of the night. Cohen accepted his honor by predicting a return “to those glory days,” a “magical time” of “endless possibilities and endless promise” like the one that led to the foundation of 212NYC back in 2003. “I don’t think any of the founding board members realized or had any idea what we were in for fifteen years ago,” he said. He also highlighted that, as the industry as a whole realizes the value of “trust,” “transparency,” “quality,” “relationships” and “effectiveness,” we’ll continue to “keep fighting the good fight” and move forward towards a return to a new era of endless possibilities. We agree with him: advertising’s best days are ahead of us. The Gala continued with the presentation of the 212NYC Weaver Award for Digital Sales Excellence, Katherine Divney, Seeking Alpha, and Meiling Morris, Scripps Networks, not only for crushing their numbers but also for making “those around them better every single day,” setting out “to create real business value for their clients and agencies” and elevating the profession “through their behavior and their character.” Congratulations! Ed Wise, Vice President of 212NYC then introduced Deb Bluman who presented the 212NYC Ari J. Bluman Rising Star Awards to Alyssa Sergi, Wavemaker, and Anishaa Janardan, Spark Foundry. “Ari was a mentor and an advisor. He helped people find their North Star so the Rising Star award makes perfect sense. The industry needs mentors, thought leaders, invisible hands to offer unconditional support to your teams,” she said.